In fact, there is a strong argument in favor of ITC adjudication of FRAND-encumbered patents. As the name suggests, FRAND-encumbered patents must be licensed by their owners on reasonable, nondiscriminatory terms. Despite Apple’s claims that Samsung refused to negotiate, this seems unlikely (and the ITC found otherwise, of course). What’s more, post-adjudication, the FRAND requirement associated with a FRAND-encumbered patent remains. As a result, negotiation over license terms for FRAND-encumbered patents can only be more likely than for other patents on which there is no duty to negotiate. Agreement over terms is similarly more likely as FRAND narrows the bargaining range for patent holders. What that means is that (1) avoiding a possible ITC exclusion order ex ante is a simple matter of entering into negotiations and licensing, an outcome that is required by FRAND, and (2) ex post (that is, after an exclusion order is issued), reinstating the ability to import and sell otherwise-infringing devices is also more readily accomplished, likewise through obligatory negotiation and licensing. What we have warned is that patent litigation at the ITC—where the only remedy is to keep products from the American public—is too high-stakes a game for patent disputes. The fact that the ITC’s intellectual-property-dispute docket has nearly quadrupled over 15 years only raises the stakes further. Smartphone patent litigation accounts for a substantial share of that increase. When the patent holder isn’t practicing the technology itself. Courts have routinely found shutdown relief inappropriate for non-practicing entities. Patent trolls shouldn’t be permitted to exclude products from our shores. When the patent holder has already agreed to license the patent on reasonable terms as part of standards setting. If the patent holder has previously agreed that a reasonable licensing fee is all it needs to be made whole, it shouldn’t get shutdown relief at the ITC. When the infringing piece of the product isn’t that important to the overall product, and doesn’t drive consumer demand for the product at issue. There are more than 250,000 patents relevant to today’s smartphones. It makes no sense that exclusion could occur for infringement of the most minor patent. The ALJ found that the evidence did not support a conclusion that Samsung failed to offer Apple a license on FRAND terms. Apple argues that Samsung was obligated to make an initial offer to Apple of a specific fair and reasonable royalty rate. The evidence on record does not support Apple’s position….Further, there is no legal authority for Apple’s argument. Indeed, the limited precedent on the issue appears to indicate that an initial offer need not be the terms of a final FRAND license because the SSO intends the final license to be accomplished through negotiation. See Microsoft Corp. v. Motorola, Inc. (because SSOs contemplated that RAND terms be determined through negotiation, “it logically does not follow that initial offers must be on RAND terms”) [citation omitted]. 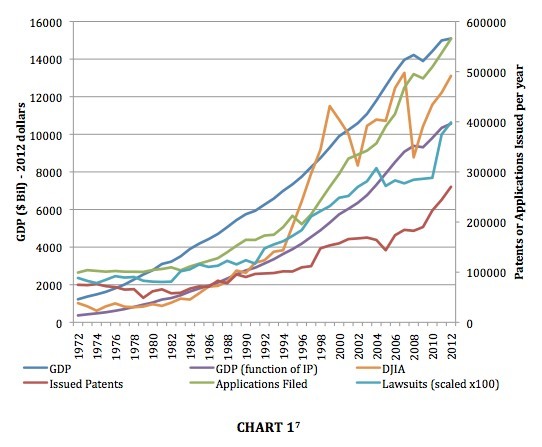 Apple’s position illustrates the potential problem of so-called reverse patent hold-up, a concern identified in many of the public comments received by the Commission.20 In reverse patent hold-up, an implementer utilizes declared-essential technology without compensation to the patent owner under the guise that the patent owner’s offers to license were not fair or reasonable. The patent owner is therefore forced to defend its rights through expensive litigation. In the meantime, the patent owner is deprived of the exclusionary remedy that should normally flow when a party refuses to pay for the use of a patented invention. 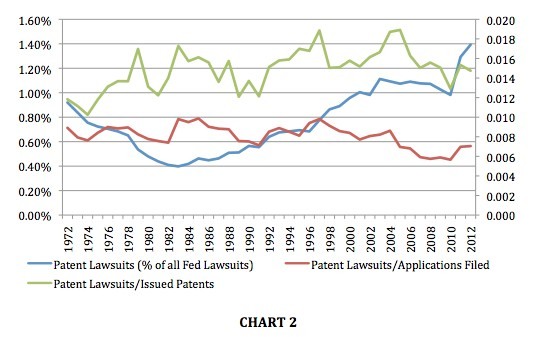 Over the last 40 years the number of patent lawsuits filed in the US has stayed relatively constant as a percentage of patents issued. And the accompanying charts paint the picture even more clearly. Perhaps the numbers at the ITC would look somewhat different, as it seems to have increased in importance as a locus of patent litigation activity. 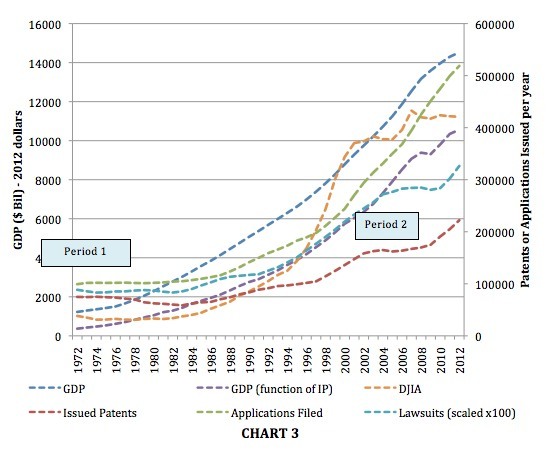 But the larger point about the purported excess of patent litigation remains. I hasten to add that this doesn’t mean that the system is perfect, in particular (as my Law360 piece notes) with respect to the issuance and enforcement of design patents. But that may be an argument for USPTO reform, design patent reform, and/or, as Scott Kieff (who, by the way, finally got a hearing last week on his nomination by President Obama to be a member of the ITC) has argued, targeted reforms of the presumption of validity and fee-shifting. But it’s not a strong argument against injunctive remedies (at the ITC or elsewhere) in SEP cases.